When Mahindra unveiled the XUV500 a few years ago, they introduced a vehicle that was not only modern but also one that was indigenously developed and manufactured, a real 'Make in India' story. It offered segment firsts unheard of in its price range. Other SUVs were beginning to feel dated and the XUV added some much needed flavour to the segment and appealed to a large audience. The flagship Mahindra has been a bestseller ever since, selling more units than similarly priced sedans even. But it's been around for four years now and competition seems to be catching up, a good time for an update then. The outgoing XUV is an interesting design - it is a head turner but then there were these few elements that we felt was overdone. The updated model now gets a facelift. It does give the SUV some added appeal but let us look at it in detail. The headlamps are new and feature a different cluster, an S shaped LED guide light splits the projector and halogen sections and gone is the simple light strip. The family grille is very much present but has been tweaked and is finished with gloss black and chrome elements. The bumper is all-new and it's a lot more curvy but it's the various new add-ons that have contributed more to the facelift. For instance, the repositioned fog lamp and an angular gloss black/chrome inserts now replace the cheetah whisker inspired cut-offs on the bumper. There's quite a bit of chrome and we would have preferred just the gloss black bezel instead. The XUV you see here however is the top variant, the base models hopefully miss out on the excess chrome. Apart from this, the revised face is still striking. The bonnet too is different - it misses out on the definition lines and now features a smoother top. The sides don't receive any major changes, only the wheels are new and look a lot more elegant than before. There's chrome too in the form of a window trim that runs along the entire glass area while the unique door handles get a slightly revised design. The mirrors look the same but now feature puddle lamps under them, a useful addition in our opinion. The back doesn't see any change in design either. Only the boot garnish that I felt was quite small earlier is now sized well and flows better with the surrounding lines. The metallic orange XUV you see here is a new hue option. Step inside, and you'll notice a more lively and airy cabin. That's because, the previous black/purple and walnut/beige interior has now been replaced by a black and beige theme. The quality of materials used is better too and the fit has improved. The backlit colour everywhere has changed from red to a more soothing light blue. There are added features too, the infotainment screen is now a larger seven-inch touchscreen and uses a new interface that also gets a reverse camera output with parking guides that adapt to steering input. Stereo features are also better integrated and there are a few added functions. Keyless entry and go is also added, the push start button is positioned on the centre console ahead of the gear lever. There's a sunroof and a six-way adjustable power driver's seat too, which we are guessing are offered as standard in the top variants. Mechanically, there aren't any major changes. The 2.2-litre mHawk motor still produces a healthy 140PS of power and 330Nm of torque. However, the final drive ratio has been altered for improved acceleration. On the road, the Mahindra XUV500 facelift feels a lot eager to get off the line. Even the motor felt a lot more linear. We couldn't test the vehicle but will soon find out if it is quicker than the previous model. Brake energy regeneration has been added to improve fuel efficiency. The ARAI claimed figure is now 16kmpl, up from 15.1kmpl. The suspension has been upgraded, the springs are new and is claimed to improve ride quality and high-speed stability. 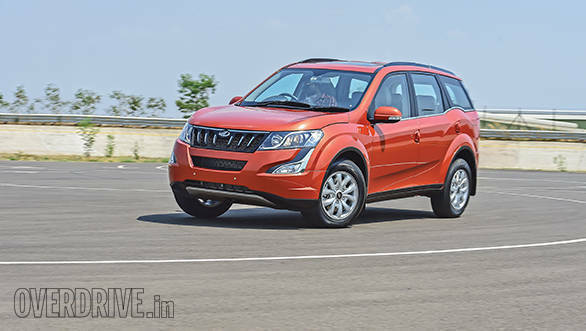 We drove around the smooth Mahindra test track in Chakan and though we couldn't really make out any difference in ride quality, the SUV did feel more planted. The updated XUV500 is out on the roads now. A lot of updates have been carried out based on feedback and this makes it a lot more desirable. The SUV now gets added presence, improved driveability, better economy and a longer list of features that are easily the most we've seen in any car in this price range. Mahindra has priced the XUV500 at Rs 11.21 lakh (ex-Delhi) and its high end, feature-loaded variant, the W10 AWD retails at Rs 14.99 lakh.